Some day in the not-too-distant future, a young, would-be hip-hop artist in Brazil will come up with the perfect rap name and Google it, only to find it’s already been taken by a restaurant chain founded in Charlotte, N.C. Alas, while Sao Paolo will never experience the dope beats of Kid Cashew, Mt. Pleasant residents can now enjoy brunch, lunch, and dinner there. Oh, and it’s apparently named after a goat. Set in the site of the former Triangle Char and Bar, the space has been quickly, but lovingly, renovated into a welcoming, rustic-chic eatery. Similarly, the menu is largely approachable, with a strong Mediterranean slant. 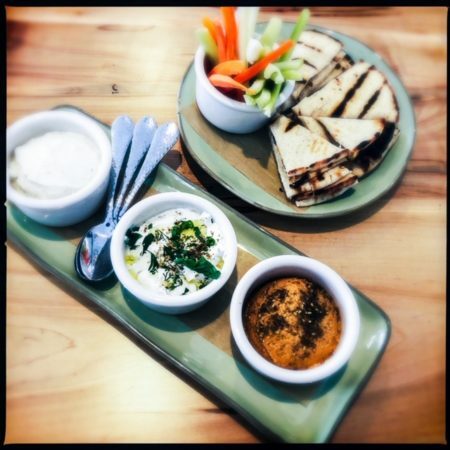 The appetizer options are led by a selection of three homemade spreads; hummus, tzatziki, and spicy feta ($5.95 each or $15.95 for all three). The tzatziki is excellent, loaded with delicate dill and shredded cucumber, then topped with fresh parsley and a slug of olive oil. The hummus, however, is a bore. Presumably made with (otherwise indiscernible) roasted red bell peppers, the orange dip is thick and garbanzo-heavy. More tahini, lemon, and/or garlic would be welcome. The spicy feta should come with a liability waiver. Seemingly made with equal parts feta cheese and Carolina reapers (but according to the menu, just minding-their-own-business jalapenos), it is extremely, WTF-ing-ly, eye-poppingly spicy. But it’s addictive … at least for us masochists. “I’m burping up flames,” whimpered my dining companion, while going back for more. The spreads come with a choice of slightly over-charred pita triangles or a mix of raw carrots and celery sticks. If you want both, it’s an additional $2, which seems a bit nickle-and-dimey considering the portion-to-price-tag ratio. While the small ramekin is a sufficient size for the rich feta, it feels woefully inadequate where the hummus is concerned. Vegans, rejoice! There’s a fairly hearty list of options for those eschewing all forms of animal products, including a quinoa-stuffed avocado ($3.95 for half and $7.75 for a whole). What arrives is … odd. Set in an Easter basket-like nest of shredded iceberg lettuce (why? ), the avocado is filled with quinoa and entirely obscured by a melange of cucumber, tomato, and pungent red onion. Drizzled with chipotle sauce (do they have chipotles in the Med?) 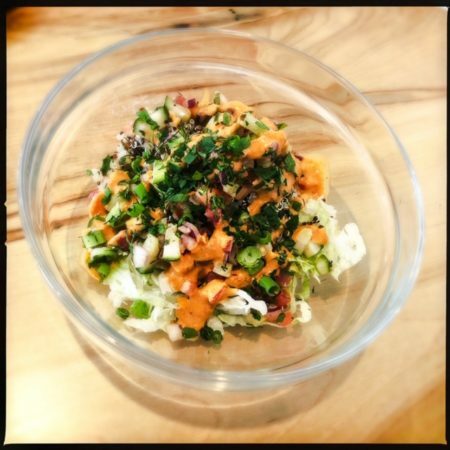 and topped with green onions and parsley, there’s clearly a lot going on here. All the while, it’s hard to determine where it’s going. Although the ingredients would definitely make a good topping for a fish taco, it’s a rather strange appetizer. 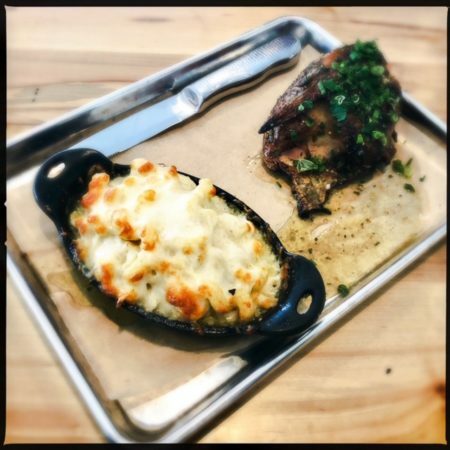 The same can be said for the cast iron mac and five cheese ($6.95), made with ‘homemade mornay sauce, creamy leeks, and shallots,’ but wholly dominated by the assertive flavors of gruyere and Swiss cheese. If you order this expecting the mild, Southern classic, note that none of the five cheeses used in the mix — billed as kasseri, gouda, gruyere, fontina, and parmesan — happen to be cheddar. Service was provided by the bartender, a man whose soul is quite possibly possessed by the restaurant’s point of sale system. Consistently turning his back to the bar and surrounding tables for excruciatingly long stretches of time, gaining his attention bordered on impossible as he stared — seemingly enchanted — at the glowing screen. Whether the machine has become self-aware or is acting as a type of oracle is unknown, but here’s hoping it’s never too busy in there, as the grip it has on him is clearly profound. 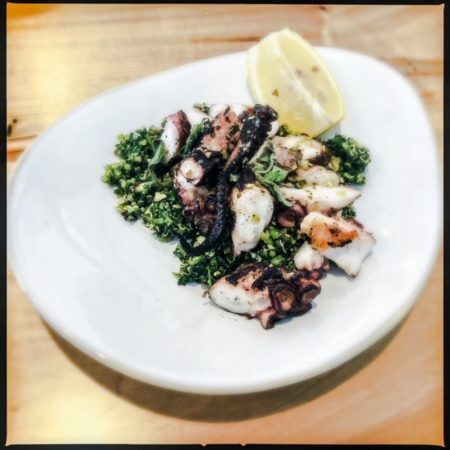 Meanwhile, the wood fire-grilled Spanish octopus ($12.95) shows real potential. Although overcooked and, making it regrettably chewy, the rich, smoky flavor is a highlight. Similarly, the crunchy base of finely chopped raw kale and cooked quinoa, generously seasoned with garlic and lemon, is outstanding. Maybe (please) fill the avocados with this instead? Kid Cashew offers a variety of creative speciality cocktails (all $10), like the Big Fig Newton, made with bourbon, chopped rosemary, and figs. If you can get past the off-putting name, the Goat’s Breastmilk features the delightful juxtaposition of mild-mannered amaretto and honey with powerful ouzo, lemon, and mint. There’s also a full bar, plus a handful of bottled beers and a respectable assortment of wines by both the bottle and glass. 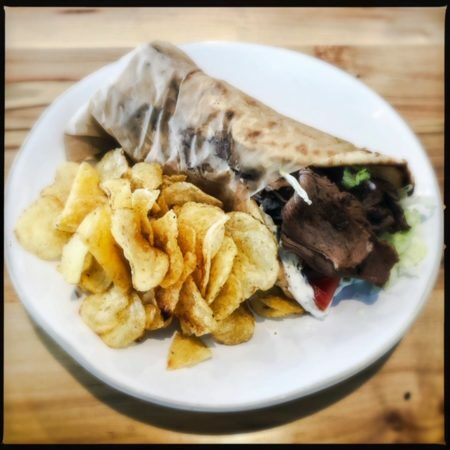 The roasted lamb gyro ($10.95) arrives on a large toasted pita loaded with thin red onions, iceberg lettuce, and chopped fresh tomatoes. The thinly sliced lamb meat is leaner than the cuts taken from the more-traditional spool of roasted pork and lamb, but still holds it own. Topped with the same perfectly executed tzatziki, it’s a successful riff on the Greek street food classic. The all-natural smoked chicken (half $11.95, whole $18.50, served a la carte) is brined for 48 hours, the flavors permeating deeply into the bird. While the skin was incredible — crisp and flavorful — the white meat was woefully overcooked and painfully dry. The dark meat, however, is why the Greek gods made wood fire grills. Go get some. Kid Cashew is new, at least in some respects. The restaurant group behind the establishment is no stranger to success, and the same formula has clearly been lucrative in Charlotte. With a little more fine-tuning of the wood fire grill and an exorcism performed on the bartender’s cash register screen, it’s likely this burgeoning chain with the ‘what’s that again?’ name could soon be considered Mt. Pleasant’s go-to land of (goat’s breast) milk and honey.